The following material was presented in the doctoral colloquium at Southwestern Baptist Seminary on October 20, 2012. For more information about doctoral studies in Church Music at SWBTS, click here. 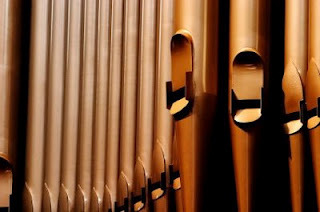 Rather than decry the decline in the organ’s usage in many of our churches, this writer, who has been an organist for forty years, would like to offer seven reasons why the instrument should be used in contemporary worship, along with some advice to organists. 1. The organ provides a way to minister to people who come to us from various backgrounds. As people seek connections with known traditions, many have expressed sadness at the organ’s absence. To them, it is not an outdated icon, but a vital link to their heritage. Its reappearance would be a much needed “shot in the arm” for many who, for years, have felt disenfranchised. 2. With its wide dynamic range and spectrum of colors, the organ is reflective of the many ways God speaks to us. Its majesty can remind us of God’s thunder, and its quietness of His still, small voice. 3. The organ is relevant in that it IS different from the sounds people hear in our secular, media-dominated world. As Christians, we are not to be conformed to this world, but be different from it. 4. Though having fallen silent for years, many organs are still present in churches. 5. Though not as many as before, there are still organists around. To find one, contact your nearest chapter of the American Guild of Organists, or music teacher organization. 7. Contrary to the belief (prejudice) of some, the tonal resources of the organ render it effective, not only in accompanying traditional hymns, but also in supporting the singing of contemporary worship music. a. The organ can be a vital part of a praise band. The division that makes it the most useful for this is the pedal. The sound of a bass guitar, though it might be loud enough, decays at various rates, much like that of a piano. The organ pedal can be sustained indefinitely, according to the needs of the music. The depth and presence of pedal sound provides a palpable foundation that people can not only hear, but “feel”, which encourages them to sing! b. The organ need not always sound loud or shrill. With proper usage, it is capable of blending well with almost any combination of electronic or acoustical instruments. It can fill in the tonal “gaps” present in many ensembles. Organs of the 21st century, in addition to their traditional sounds, are capable of MIDI interface, thus making full use of sounds in the modern musical landscape. 1. Recommit yourself first to the Lord, then to your calling as a worship leader. Worship is a corporate activity and, though you may occasionally be a soloist, your main role is to help the group to sound better, and to encourage the people to sing. a. In most “blended” styles of worship, you will sometimes lead out in the singing of a majestic hymn. These skills must never be allowed to deteriorate. Proper introductions, registrations, attention to phrasing and breathing, will always be vital to effective hymn accompaniment. b. Improve your sight-reading skills. You function best as a supportive accompanist, regardless of style, when you can play the right notes, especially in rehearsal. The only way to improve sight-reading is to practice it! In addition to reading actual notes, improve your ability to read chord charts. This is especially necessary with contemporary music. One would be hard pressed to find any contemporary worship song with an accompaniment written for organ. Most are written for piano, but many of those accompaniments can be easily adapted to the organ from the notation itself. However, that is not always true, and the charts are the fast track to effective voicing of the harmony. c. Appropriate registration is the key: with contemporary styles, 16’ and 8’ pitches should be used in the pedal, and the manuals should go no higher than 4’. Listen for the strength and color of stop combinations, to achieve blend and balance. d. In any style of music, rhythm is paramount. Many rhythms in contemporary styles are driving and highly syncopated. These need not be foreign to the organ. Certainly the organ cannot be played like a piano, nor be expected to have the same rhythmical effect; but a judicious adaptation of the rhythmic figures to the organ, with clear and appropriate articulations, can have a positive effect on the rhythmic vitality of almost any piece. e. If all of the above seems overwhelming, help is available! An excellent source of skill improvement are the various levels of certification provided by the American Guild of Organists. Also, simply connecting with colleagues and networking with them, can provide many avenues toward improvement. 3. Seek opportunities to convince your worship leader of the organ’s effectiveness in the contemporary setting. 4. Make sure the instrument is functioning properly. Always keep a sharp ear for tuning, and for any re-voicing or other adjustments that need to be made. Find a competent, accessible organ builder/technician and maintain a good relationship with that person. Hopefully, by employing some of these suggestions, organists can find new ways to use the King of Instruments in praise to the King of Kings! Dr. Jerry Aultman serves on the faculty of the School of Church Music at Southwestern Baptist Theological Seminary, and is organist at the First Baptist Church of Dallas, Texas. He is a Fellow in the American Guild of Organists. I am Orthodox Christian and yes the organ music of Poulenc, Bach is sublime but the only instrument for Worship is the human voice. For the west the organ has become tradition and at least you have a historic tradition for it. Personally I prefere for human voice stringed instruments as nearer human voice. 1 Pings/Trackbacks for "Seven Reasons Why the Organ Should Be Used in Contemporary Worship"